If you are an entrepreneur already, or want to be one, you know how to work hard. Really hard. There are no such thing as “long hours” because those are the only kind of hours you know. You are a one-person problem-solving machine. You make things happen and you chase dreams that others think are crazy. And you love it. That’s who you are and you wouldn’t have it any other way. But being in go-mode, full-throttle, all the time can have an unintended side effect: You get comfortable in your silo of work-a-holism mixed with -- admit it -- a bit of egoism. It feels good to do what you are already good at. And if you only ever do what you are best at, you don't ever get hurt. Which, in one sense, is actually pretty convenient for the ego. After all, the best way to avoid being rejected is to not put yourself out there. But if you are going to be a leader, a change maker, a catalyst in society, if you are going to build something bigger than the walls of your own ego can hold, then you also must learn to be vulnerable. You must put your ego aside and reach outside of your silo. The problem is that being vulnerable is terrifying. That’s exactly what Adam Braun learned as he was growing his nonprofit global education organization. Based in New York City, Pencils of Promise builds schools all over the world for underprivileged children. Braun launched Pencils of Promise in October of 2008 with $25. Today, Pencils of Promise has broken ground on 200 schools in Ghana, Guatemala, Laos and Nicaragua. Of those, 168 are completed and 32 are under construction. The organization, though a non-profit, is run with a sharp business-minded sense of financial accountability and has grown to the point of having 70 employees. Last year, the organization raised $5.4 million. It wasn’t long ago, though, that Braun could not get over his own ego. He couldn’t bring himself to ask for money. And he was trying to run a nonprofit organization. It was a problem. Not only was it a problem for Braun, but it was holding back his entire organization. 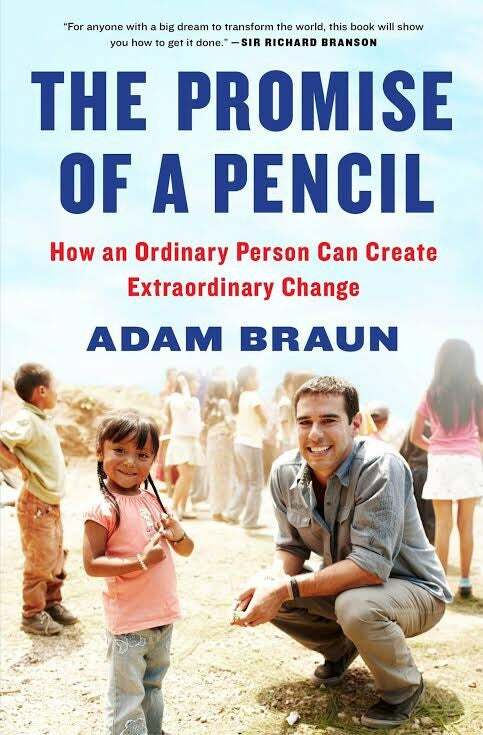 Below is the 27th chapter of Braun’s 30-chapter book, The Promise of a Pencil: How an Ordinary Person Can Create Extraordinary Change, which is published by Scribner and will be coming out next month. Each chapter in the book starts with a mantra that Braun has learned to adopt in his crash-course in becoming a leader. Pencils of Promise’s exponential growth has positioned Braun as a world-renown social entrepreneur. In each chapter, Braun follows with a story of how he came to learn that particular lesson. Read this excerpt from Braun’s new book on how he learned to step outside of his own ego to confront his fears and ultimately gain the trust of who became an invaluable mentor to the Pencils of Promise story. Click on the image of the book cover to pre-order a copy of Braun's book. In my first three years of running Pencils of Promise, an organization that desperately needed cash to grow, I did not directly ask anyone to donate a specific amount of money. Not one person. I hated asking people for money. “I’m an entrepreneur, not a fundraiser,” I repeated to anyone who would listen. I simply refused to ask. I’d worked since I was twelve years old and always found ways to independently make and save money for the life I sought to create. So now, relying on others just didn’t feel right. Asking people for favors made me feel beneath them. I didn’t want to ask for money unless I could reciprocate. Although I knew plenty of people who were in a position to give a generous gift—and who didn’t need anything in return—I couldn’t get over asking someone I knew to open his or her wallet and write a check. I despised the idea. But here’s the truth: I was scared. Scared to face rejection. Scared to hear no. Scared to be seen as someone who was asking for a handout. I was afraid of that moment of relinquishing control, of allowing someone to judge me. I was afraid of admitting that I couldn’t do it alone. And so I didn’t. At first I thought of different ways to raise money that would spare me from personal discomfort. Selling tickets or tables to our masquerade party or annual gala was transactional. I also relied on our website to solicit donations without initiating any awkward conversations, and our industry-leading social media presence attracted corporate sponsors that offered contributions in return for marketing partnerships. These created streams of revenue for the organization that few nonprofits were able to develop, and it differentiated PoP in a crowded space, allowing us to make the case that we earned our money rather than asking for it. The problem is, fundraising—asking individual donors, or heads of foundations, to give—is a pivotal part of leading a nonprofit organization. Building an engaged, dedicated donor base is essential to long-term success, and most major donors prefer to be asked for their support directly. Yet, I avoided it completely. With so many other essential pieces to focus on, why prioritize monetary matters when I could instead be doing what I loved— traveling around the world to work with communities that needed new schools, refining our beautiful website, and developing an incredible team that could extend our reach. Something clicked for me when our CFO, Tom, became a father. I met his newborn son, Michael, looked into his big eyes, and realized the massive sacrifices our staff was making. Tom, and all of the people at PoP, had supported me and my dream at first, but it was now their dream too. They took lower salaries, worked insane hours, and passed up more lucrative job opportunities to create the organization we all envisioned. Now these people had children of their own, and this was no longer just my personal pursuit. I was responsible for the financial well-being of my staff, and the educational opportunities of the children we supported in countries where we worked. I’d given up most of my social life and sleep to PoP—but I realized I’d been pouring the lion’s share of my energy into the wrong things. The tasks I ignored were the ones I feared. How many times do you have thirty things to do and you focus on the twenty-five that matter least? How many times do you check your email and deal with what’s easy, but not necessarily what’s important? These small wins are easy to achieve, but they won’t move the needle. In the end, the big wins, the most daunting tasks, are the ones that matter. One of the most important parts of being a leader is to look in the mirror and tell the truth about what you are seeing. Even if—especially if—it’s not good. And the only way to let others in is by speaking out. I decided it was time to ask for help. Related: You Know Malala. Now, Meet Shiza. At our next board meeting, after presenting my usual materials, I asked for time to share some honest thoughts. We were sitting at a conference table on the twenty-fifth floor of a Manhattan skyscraper with floor-to-ceiling windows overlooking Times Square, and instead of presenting my strongest and most impressive front, as I always tried to do at these meetings, I was going to reveal my weakness. Surrounding me were ten of the smartest, most capable people I knew. Each had achieved tremendous success in business and philanthropy, and I had to tell them about my biggest failure. I wasn’t even nervous; I was resolved—that’s how badly I needed help. “I need to learn to ask people for money. This is my biggest weakness. I need to get over it.” In admitting my flaw, I showed them that I was vulnerable, but that was okay. I established trust. These were industry leaders with years of professional experience, who were each taking a gamble on me as a leader, and before that moment I’d always tried to seem invincible to the board. If they had a question, I had an answer. But in acknowledging where I needed help, I deepened my relationship with them and, ultimately, amplified their commitment to my growth as a leader and an individual. Two of my nonprofit friends and mentors, Charles Best, the founder of DonorsChoose.org, and Scott Harrison, the founder of charity: water, recommended I participate in Exponential Fund-raising, a program through the Hauser Center for Nonprofit Organizations at Harvard, taught by fundraising guru Jennifer McCrea and philanthropist Jeffrey Walker. Leaders of many sterling nonprofits had been through the program. I received a partial scholarship and the seminars were informative, but the greatest revelations came from trading war stories with Sydney, the founder of Educators 4 Excellence, and Reid, the founder of Equal Opportunity Schools. One night, after a full day of courses, we stayed up until 2:00 a.m. in the common room of our Harvard Business School dorm, both of them recounting their experiences asking wealthy philanthropists for major donations. Reid asked for $500,000 but got $250,000. Sydney asked for $50,000 and got the full amount, but now wished she’d asked for $100,000. The stories went on and on, while I sat there in silence. “I’ve never asked a single person to write a specific check,” I admitted. They couldn’t believe it. Here I was with an organization that had achieved fantastic growth and broken ground on more than fifty schools, and I had yet to do the most basic task for the founder of a nonprofit. I thought, What’s wrong with me? In asking that question I immediately realized the root of the problem. It wasn’t just about fear. It was about ego. I was putting myself at the center of the equation. I was so personally attached to PoP that I felt as though I were asking for myself. I didn’t recognize that the ask wasn’t for me. I was just an ambassador for the organization and for the children we served. With four offices around the world, thousands of students in our schools, and millions of educational hours being delivered, this was about something bigger. It was about our first students Nith and Nuth, four-year-old girls, who now had a preschool to attend. It was about the second-graders in Guatemala who were learning to read and write for the first time in a Pencils of Promise school. The money I asked for wasn’t for me; it was for them. It was to change their lives, not mine. As soon as I shifted my focus to the children and our staff, I suddenly became excited to make an ask. It no longer felt like a burden. It suddenly became an honor. Soon I had my first opportunity. I had met Paul Foster, a New York–based investor, six months earlier at our gala. He was a friend of our event producer and bought a table to attend the event. During the night I invited supporters to join me on a trip to Laos for contributing at a certain level. Twenty hands shot up, thousands of dollars were raised, but when I flew to Laos several months later only one family had made it their top priority to fly halfway around the world to meet me on the ground. The Fosters. As soon as I landed, Lanoy picked me up with her Shark Book in hand and we drove straight to Lemongrass Restaurant in Luang Prabang to meet Paul and his family. In the days ahead we visited Pha Theung to see the first school, swam in the river with the children, and found ourselves sleeping in a shared bamboo hut in the remote village of Phayong. Paul and I bonded that week, and he told me his story of working as a head trader at a well-known investment bank, becoming president of a leading hedge fund that he grew to $20 billion in assets, and then leaving it all to retire and focus on raising his kids at the age of forty-five. When we returned to the states, Paul and his family visited the PoP office. The Laos trip had been an awakening experience for the entire family. Paul pulled me aside and told me that he wanted to be more involved. Here was my opportunity. I decided I would ask Paul to be the first to join our advisory board—a commitment of three years and $250,000 per year. It was a huge ask, but I figured I might as well go big the first time around and see what happened. I asked Paul if we could meet up the next month in New York City, and he suggested a prestigious private club in midtown. “You’ll have to wear a jacket and tie,” he said. I hated dressing in business attire, so I wore my black jeans to the meeting. Paul, whom I had only seen wearing shorts while in Laos, met me by the club’s sprawling carpeted staircase. I looked up. He was in a power suit: pinstripes with a tailored shirt and sharp tie. I looked down. My faded jeans had holes on the cuffs. I felt like an idiot. He greeted me kindly and led me to the dining room. He passed me the lunch menu and recommended several of the entrées. I had just started my first ever juice fast. I ordered a grapefruit juice with embarrassment. He laughed, and finally the ice was broken. Paul opened up to me about how meaningful the trip to Laos was for him and his family. Toward the end of the meal, he spoke about how much he wanted to help. “Most people would not leave Bain to do this, and I want to know how I can be supportive,” he said. Here was my chance. “Paul, your words mean so much to me. Truthfully, I am trying to put together an advisory board for the organization made up of people who are deeply invested in our work. It would mean the world to me if you were the first to commit. This would entail you and I speaking regularly so I could gain your mentorship and advice. I would also love for you to introduce me to anyone else who you think would be a good fit, and I would like you to consider making a three-year commitment”—I wanted to say, “of $250,000 per year,” but chickened out and instead said, “of six figures per year to Pencils of Promise.” My face was still, but my chest was pounding. It wasn’t a no. I still had time to maneuver. “Would you consider $100,000 per year?” I asked. I left feeling exhausted and relieved. I’d made the ask, although it didn’t go as smoothly as I’d hoped. Whether successful or not, I was taking steps forward on behalf of the organization. I sent Paul a nice thank-you email, along with some materials to help consider the request. This was amazing news. I pumped my fist in the air. “Good, great, please tell me,” I said, bracing myself for whatever was next. “First, Adam, if you are asking people for large sums of money, you need to dress the part. You can’t wear jeans to a meeting at a private members club. You have to get a nice suit. Paul has since introduced me to countless stellar people, many of whom have become significant funders of our work. Immediately after each meeting, I now send out a follow-up email detailing the commitments made by both sides so there’s mutual alignment. Paul then calls them to ask what they think, gains critical feedback, and calls me to relay exactly what was strong and weak about my performance in the meeting. I now have someone who is brutally honest with me on a daily basis and coaches me through my greatest areas of personal growth. We all spend so much time putting up walls so that others can’t see our vulnerabilities, but those same walls often enclose us within our own insecurities. By showing my true hand to my board of directors, they helped me turn a weakness that I was avoiding into a newfound strength. We all know which tasks are the most important in any given day, yet we still choose to do them last. Choose to do those things first. When I initially asked Paul to invest I was hoping to get over my fear of asking for money to support our organization. His generosity helped in that area, but I ultimately gained so much more. I got over parts of myself that were holding us back, and I learned that the hardest climbs are the ones that yield the most reward.